The object of the research in the chapter is green vegetable crops grown in a manmade environment. The purpose of the presented research is to study the process of growing plants in a man-made environment, the main influencing factor of which is the man-made sources (LEDs) emission, as well as to design and construct the installation (irradiation chamber) for implementation of the studied technology. 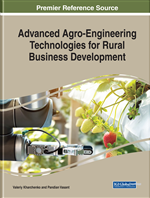 The chapter presents the results of experiments conducted by a team of researchers, which allowed to determine the technological process indicators of growing green vegetable crops in a man-made environment, and also to develop designs for small-sized irradiation chambers with automatic control, both for laboratory research and for small business and private use. Studies were conducted in different regions of the country and combined the efforts of several scientific groups of researchers. The chapter presents the results of researching these areas conducted by the authors, which are completely original. Light or natural optical radiation is the most important abiotic factor for plant life and its role is primarily determined by a special plants’ position in the biosphere as autotrophs, forming organic matter from simple inorganic compounds, while using the solar radiation energy for synthesis (Tooming, 1977; McCree, 1981; Raven, Evert & Eichhorn, 2005). Light is necessary for the normal development of plants for three reasons. First, it is needed for photosynthesis process, when CO2 and water combine in the presence of light to form carbohydrates - food for plants. Second, light regulates the external appearance of plants, their constitution. Third, the relative duration of light and darkness periods controls a number of natural physiological processes in plant development and, in particular, blooming of a large number of them (Mashkov, 1966; McCree, 1981; Raven, Evert & Eichhorn, 2005). Poor lightning can affect one, specific, or all of the plant’s cellular reactions. Therefore, when man-made lighting is used to change the growing conditions, the nature of its effects on the reactions that arise should be taken into account. Life processes in a plant organism are closely related both to the intensity of light and the irradiation mode, and to the spectral composition (Protasova, 1987; Protasova et al., 1990; Tikhomirov, Lisovsky & Sidko, 1991; Kong et al., 2015; Ouzounis, Rosenqvist & Ottosen, 2015). Light intensity affects the photosynthesis rate. The average daily natural light intensity is 100 W/m2. Green Crops: Mean vegetable plants grown to produce fresh greens used for food fresh. Photoculture: Means the process of effective plant cultivation using man-made radiation sources, the energy of which is necessary for the photosynthesis process. Photosynthetically Active Radiation (PAR): Means a part of the solar radiation reaching the biocenosis (plants) in the wavelength range from 400 to 700 nm, used by plants for photosynthesis. Optical Spectrum: Means the electromagnetic spectrum or the distribution of electromagnetic radiation intensity by frequencies or wavelengths. Pulse-Width Modulation (PWM): Means the process of managing power supplied to a load, by changing the pulse ratio at a constant frequency. Light-Emitting Diode: Means a semiconductor device with a single p-n-junction, where the direct conversion of electrical energy into thermal energy occurs.